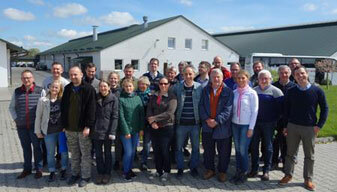 In May, Merck Animal Health (known as MSD Animal Health outside the USA and Canada) hosted udder health and milk quality experts from 10 different European countries, to learn more about the Polish dairy industry at a meeting in Gdansk, Poland. The group visited a farm with over 1.000 cows. The farm is unique because not only is it much larger than the average dairy farm in Poland, producing 11.500 kg of milk per lactation, but the farm has implemented an ambitious mastitis control program, which helped to optimize udder health management allowing for ample milk production. During this time together, attendees also began a collaborative research project that will highlight correlations between genes and clinical outcomes of the major pathogen, Staphylococcus aureus, collected from 10 different EU countries. Results of this research will be presented at the next European Mastitis Panel meeting in Budapest, Hungary, next May.